Unless you’ve been living under Boris Johnson’s Brexit campaign bus*, you probably know that a kid was killed by an alligator in Florida a couple of weeks ago. At first I dismissed the story - it just seemed to be a part of the media’s love affair with ‘disproportionality of fear’ stories; meaning, telling us with a straight face what we should be afraid of when what we should really fear just goes by unchecked. For instance, about 400,000 people have died in car collisions in the United States in the last 14 years. But we don’t hear about that kind of thing the way we should since the news is often a filler between car commercials. But the rare roller coaster accident? The rare child dragged around by a gorilla? The rare kid being snatched by an alligator? The network news has a graphic ready by the 5:00pm broadcast. The kid that was killed by an alligator in Florida teaches us both about the disproportionality of media attention and the disproportionality of fear (I talked about both in a piece I wrote recently for Blaze when I came across a rattlesnake while mountain biking…and found out how insanely rare fatal snake bites are). So even though the story seems to have been dragged from the media news cycle** we can actually talk about the coverage the poor child received and what the media can learn from its own coverage - and that is this: I want the media to cover bicycle/car collisions exactly like the way they covered the Alligator Kid. Stay with me: if you walk through the timeline of the Kid-Killed-By-Alligator news cycle, you’ll see several parallels to how we wish - no, how we need - news coverage of bike vs. car crashes to be. So here we go: reporters of all ages please take note. Kids move freely in an environment. So do cyclists. We think it inappropriate to blame the kid for what happened. Let’s think it inappropriate to blame the cyclist. Classic example is when the media has more information about whether or not a pedestrian hit by a car was in a sidewalk than any other detail about the crash that killed or injured him or her. The sidewalk detail is important as a detail but as I’ve written before, we can’t ask about whether or not a pedestrian was in a sidewalk in a sneering, blame-the-victim fashion. So, instantly, do not blame the victim. With the attention off the blaming of the kid (and the alligator but I’ll talk about that in a minute) the next thing that news stories have to have is an examination of the environment. In the case of the Alligator Kid: there was a ‘No Swimming’ sign but the tone taken by the press was that wasn’t enough. I saw a horrendous lack of discussion about the environment in a recent Stamford Advocate story about a cyclist who was killed by a car on Tresser Boulevard - the stretch of Route 1 in Stamford I know has just about no infrastructure for cyclists. “Without Helmet, Stamford Bicyclist Never Had A Chance” was the headline. Nothing about how God-Awful that road is for people who do not use a car to go from one place to another. At least six alligators were killed in the hunt for the one that grabbed the kid. Obviously that’s just terrible and shouldn't have happened. I don’t condone the killing of animals that aren’t ordinarily found at a New England BBQ place, the killing of motorists, the murder of everyone in the phone book named Sarah Connor, and so on. But what if - in a The Far Side sort of way - alligators could read, watch TV, and owned smart phones? In the event of someone being snatched by an unknown reptile or killed from a hit-and-run, make sure every alligator/motorist knows that heaven and earth will be moved so the guilty party is found. If everyone knows the guilty will be hunted for, found and punished severely, it will hopefully sear into the minds of innocents not to do what the alligator (or dangerous motorist) did. One aspect of a Road Diet involves reducing the width of a travel lane from 12' (or even more) to 11'. 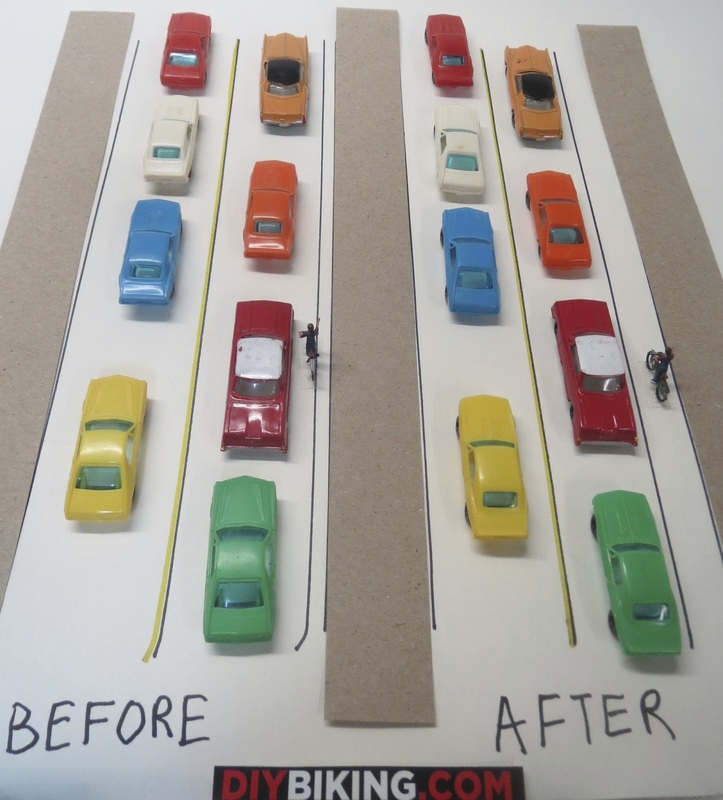 The cars tend to drive slower and the move makes room for a bike lane. The journalists in Florida just wouldn’t shut up about the lack of infrastructure that, if it existed, would have decreased the odds of the incident happening. They had a story about it every day. They showed footage of the area in the days that followed the incident. They asked concerned people how they felt about the fact the environment hadn’t changed. And the media asked the people who controlled the environment why they weren’t making it safer immediately. Over and over. The news media seemed to ask themselves what would make Disney take out a restraining order and took away a teaspoon of the effort needed to get to that stage. That’s the way the media needs to work. Are you reading this, CNN, Fox, NBC, ABC, The Hogwart's Gazette and the rest of you? Follow-up. Keep the pressure on. And annoy. You may not win any Pulitzers but you’ll save lives. So there we have it. For all the Jimmy Olsens and Tom Brokaws out there: it is never too late to apply some Alligator Coverage Logic to deaths and injuries on our roadways. I look forward to reading and viewing your coverage from now on. Thanks for reading and thanks for riding. A bit of context: This graphic was made when I was making a point about the whole issue of cyclists running red lights. That it is a problem but the stakes are a lot different when a cyclist does it rather than a motorist since the aftermath never, ever looks like this. * Watch Last Week Tonight with John Oliver if you don't know what that is. If you do know what that is, watch Last Week Tonight with John Oliver anyway.